Japan complained to the Chinese government (yes, even countries complain to each other). The reason was that a couple of Chinese boats were seen close to a set of islands that are controlled by Japan. Japan and China have been fighting over these islands for some time now. 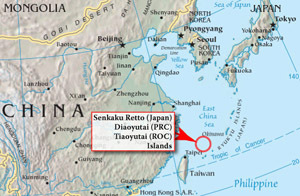 The Japanese call these islands Senkaku islands and the Chinese call them Diaoyu islands. There are eight islands, located in the East China Sea, with a total area of about 6.3 sq km (2.4 sq miles). In 1895, Japan claimed these islands. At the time there was nobody living on them. Japan also claimed the island of Taiwan. After World War II, Japan gave up some of the land that it had taken over. For example, it gave up control of Taiwan. Some of the islands that Japan owned came under the guardianship of the United States, and Senkaku (Diaoyu) islands were part of that transfer. In 1971, these islands came back under Japan’s control. But China claims the Senkaku (Diaoyu) islands were part of China’s territories since ancient times, and should have been returned when Taiwan was returned. Another twist is that while China claims ownership of the island of Taiwan, the people who live in Taiwan claim that it is an independent country. There is a reason that there is a fight for the islands. The waters around the islands are great for fishing, and could also have oil and gas. This is not the first time that there have been problems between China and Japan because of these islands. Just last month, a Chinese boat hit two Japanese patrol vessels near these islands causing friction between the two countries. The Japanese name for Japan is Nippon which means “the land of the rising sun”. This was most likely because the sun rose earlier in Japan than China, the other main civilization that the Japanese interacted with in the olden days. The Chinese and Japanese have given the world many inventions. The Chinese invented paper, printing, the compass, chopsticks, kites, noodles, restaurant menus, toilet paper, and lots more! The Japanese have given us karaoke, judo, cup noodles, brands such as Hello Kitty, Pokemon, Toyota, and much more!